Great battles are fought every day as gardeners strive to protect their precious crops, while a multitude of garden pests and diseases seek to destroy them! Pest and disease control presents a huge challenge for the gardener, and identifying the cause of the damage can often be the hardest part! Those sneaky garden beasties don't always show themselves, so how do you know whether your plants were eaten by a slug or a lily beetle? And just what is the difference between downy mildew and powdery mildew? As our Facebook and Twitter followers have asked us so many questions, we decided to bring all of the answers together to share this information and hopefully solve some of your garden problems too! If you can't find a specific answer to your problem then here are a few tips to help reduce the risk of attack. Avoid using too much high nitrogen fertiliser as this promotes lots of soft leafy growth which is particularly appetising to garden pests. Erect physical barriers - covering crops with fleece or planting fruit in a fruit cage will often prevent pests from reaching your crops. Know your enemy - Many pests and diseases are specific to particular crops. Find out what is likely to attack your crops and the type of damage that it will cause. Once you know what you are looking for it is much easier to identify a problem when it occurs. Keep your eyes peeled for the earliest signs of attack and take action. Don't let the problem get out of hand. Many diseases can be prevented by practising good garden hygiene and keeping your garden, your greenhouse and tools clean and well maintained. Improve your cultivation practises. Plants can become stressed by poor watering regimes, lack of nutrients, inadequate light and ventilation, or poor soil conditions. These stresses make them more susceptible to damage attack by pests and diseases. Encourage natural predators to the garden. Ladybirds and lacewings will happily munch their way through aphid colonies, preventing their spread throughout your garden. If you need to resort to using chemicals then make sure that you read the label carefully, and follow the manufacturer's instructions to the letter. Never spray chemicals near ponds and other water habitats. Always choose a still, calm day to undertake spraying. Always wear appropriate safety equipment. Ants - How do you get rid of ants in compost bins? - Why are there lots of ants on my peonies? - How can I get rid of ants destroying my acers in my garden? - How can I stop ants on my garden vegetables? - Why have I got ants all over the trunks of my apple trees? Will this be a problem for the fruit? 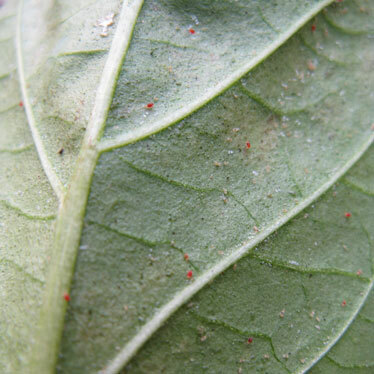 Aphids - How do I get rid of aphids on my apple tree? 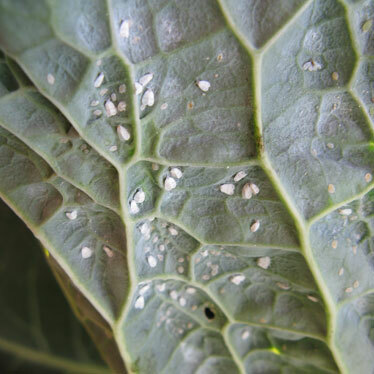 - How do I control blackfly on my globe artichokes? 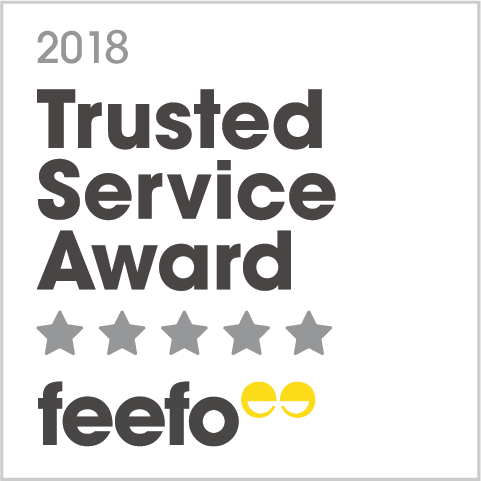 Bay Tree Suckers - Why are my bay tree leaves yellow and curled? Bean Seed Fly - What are the grubs on my runner beans? Birds - How do I protect fruit from birds? Cats - How do I stop cats digging up my plants? How do I keep cats from using my garden as a toilet? 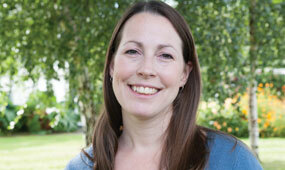 - How can I keep cats away from my vegetable garden? Cherry Aphid - How do I get rid of black cherry aphids? Euonymus Scale - Why has my Euonymus hedge suddenly died? The leaves on the infected part have withered up and dropped off, and there are tiny 1-2mm long white lines covering the stems. Gall mites - What are the grey fluffy growths on my mock orange? I cut a small piece and its bright green inside. Leatherjackets - What is the best way to control leatherjackets? Pear Leaf Blister Mite - How do I stop pear tree blister mite? Plum Fruit Moth - What is the black crumbley substance around my plums and why are there maggots in them? Rabbits - How do I stop rabbits from digging in my garden? Scale Insects - How do I kill scale insects on cyclamen plants? - What are the small white 'blobs' on the underside of some of the leaves of my cherry tree? and how do I get rid of them? - Why are all the leaves on my bay tree turning pale brown with spots? Slugs - What preventative measures can I use to stop my strawberry plants being attacked? - Why have the stems of my clematis been stripped of their outer layers? Some of the stems are dead and there are holes in the leaves. Snails & Snail Eggs - What are the small transparent jelly things on the back of my water lily leaves? 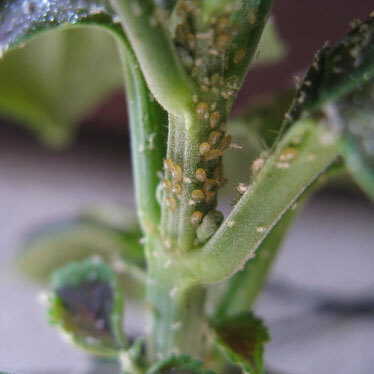 Spider Mite - How do I get rid of spider mite? - What are the little red spots on my Lotus, Black Eyed Susan, Yucca and Gloriosa? - What are the spider webs on my ginger lilies? Squirrels - How can I stop squirrels attacking my flower pots? Tawny Mining Bee - What are the small sand like mounds appearing in my lawn? Ants seem to have been ruled out as they can't be found on/near them and they seem to small for a mole. Viburnum Beetle - Why have the new leaves on my Viburnum Opulus plants turned into lace? Vine Weevils - Are there any plants that vine weevils don't like? Worms - How do I get rid of worms in my lawn? Apple Scab - What are the black spots and marks on my apple tree leaves? Apricot Bacterial Canker - Has my apricot got canker? The twigs that flowered have now died back and some have oozed gum. If I buy a new tree will it get infected too? Blackleg - Why are my pelargonium cuttings going black at the base? Blossom Wilt - Why does my cherry blossom tree always wither and die in spring time? Botrytis - How do I prevent botrytis on my pansy plug plants? Brown Rot - Why does my cherry blossom tree always wither and die in spring time? - Why have I got mould on my cherries? Clematis Wilt - Does my clematis have clematis wilt disease? Downy Mildew - Is there any cure for downy mildew on busy lizzies? - Why are my busy lizzies dying in my flower ball? Fungal Disease - Why have my strawberries got fungus? - What is the white powder on my potato leaves? - Why are the stems of my begonias rotting? Fungal Leaf Spot - Why do my busy lizzie/ impatiens leaves have black spots on them? - What are the black spots on the leaves of my chilli plants? - What are the small brown spots on my camelia leaves? - Why does my buddleja have brown spots on it? - Why have my pansies developed black spots? Greenback - What is causing greenback on my tomatoes? Honey Fungus - Why has my abutilon tree failed to come to life this spring? Leaf Blight - Why have my lilies got brown spots on the leaves? Leaf Curl - Why are my tomato plants leaves dry and curled? 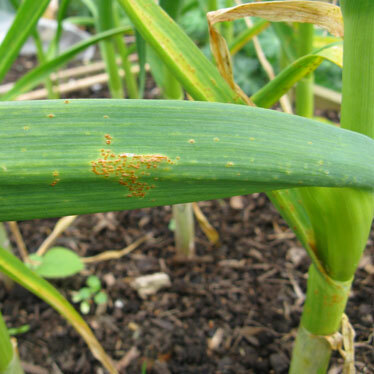 Leek Rust - How do I stop rust on my leeks? 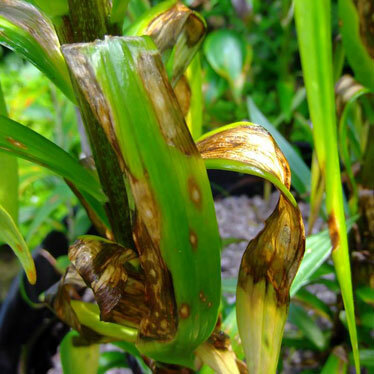 Lily Disease - Why have my lilies got brown spots on the leaves? Peach Leaf Curl - How can I stop peach leaf curl on my nectarine? I sprayed them last autumn and again this february. - What causes blisters on peach tree leaves? Pear Rust - Why has my pear tree got rust spots on? Phytophthora root rot - Why is my conifer browning in the centre? Plant Scorch - Why do the leaves on my irises look like they have been singed and have funny creases at the ends too? Powdery Mildew - How should I look after an oak sapling which looks like it has mildew? How should I look after a walnut sapling in a pot? - Is it worth keeping hardy geraniums after they had grey powdery mildew? - My large box topiary plants have white powder on them? - What do I do about gooseberry mildew? - What do I do when my clematis has white powdery mildew on the leaves and stems? 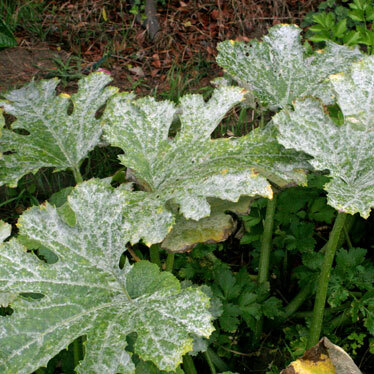 - What is the best course of action for getting rid of powdery mildew? - Why have my syringa got white residue on the leaves? What should I do to get rid of the white residue on my syringa leaves? Silver Leaf Fungus - Why are the leaf tips on my cherry tree starting to go brown and dying? It was indoors for a month before moving it outside. - Why is our Victoria Plum Tree dropping spindley branches which have curled leaves since it was pruned in January? Tomato Stem Canker - Why are tomato branches black and mouldy? Yellowing Clematis Leaves - Why are the leaves at the bottom of my clematis yellowing?